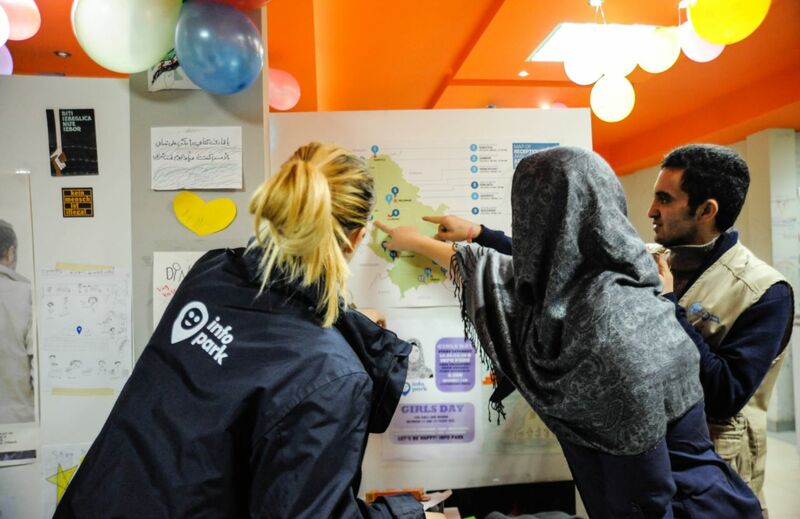 According to the results of structured interviews of Iranian citizens, conducted by Info Park since the autumn of 2017, Serbia is used as a transit zone- felt to be the safest and cheapest bypass to their final destination in Western Europe. This situation accords with the bilateral agreement between Iran and Serbia on 22 August 2017; which introduced a visa liberalization allowing citizens of Iran to enter Serbia as tourists, with the right to stay up to 30 days. Although they entered Serbia as tourists, interviews have revealed that many Iranians use their stay in Belgrade to establish connections with smugglers, who will transfer them to their desired destination, across the borders of Croatia, Bosnia and Herzegovina, Hungary or Romania. Interviewed respondents cite their reasons for fleeing Iran as the following: the sense of endangered human rights and freedoms, primarily in the domain of political, religious and sexual orientation. Many Iranians want to go to a country where there is a greater chance of economic prosperity, and see in the West the prospects of a better life. Among the interviewed population there are predominantly young couples or single men, who identify as Christians, LGBTQ population or as opposition voters. They feel unsafe and that they have been subjected to persecutions in their country of origin. Most of them arrived in Belgrade by planes of Turkish and Gulf companies with connecting flights in Istanbul, Dubai, Abu Dhabi or Qatar. In response to the increased demand for Belgrade as a destination, two Iranian airlines have contracted direct flights from Tehran to Belgrade, reopening a route that has been shut for the last 27 years. The direct line was established on 13 January, 2018, with two flights per week. This month a 156-passenger plane was set up by Iran's state-owned airline, followed later by Qeshm Air. A calculated 600 Iranian citizens can arrive in Belgrade within one week, given the transport capacity. Seeing as most of these new-arrivals do not intend to return, the migration systems in Europe must recalibrate for this new route and demographic among the migrant populaces. This strange phenomenon of tourist visas facilitating illegal migration has led, in the first place, to identification problems. The legal system of asylum procedures is not designed for this conversion of tourists to migrants. The registration that follows an intention to seek asylum is in this case not applicable, i.e., is not for ‘tourists.’ In response to this legal complexity, Iranian citizens attempt to cover up their origin, in some cases discarding or destroying their official passports. This creates great confusion between aid organizations and relevant institutions who must then register people who have rejected and destroyed their identification, and do not wish to be discovered. Inevitably, the number of Iranian citizens who failed to leave Serbia within 30 days increased, and the need for their accommodation in the centers was growing. The precondition for accommodation in the Reception Centers is a mandatory registration, with the legal expression of intention to seek asylum. Here we see yet another difficult loop at play- the Iranian citizens are certainly free to seek asylum in Serbia, the problem here is that none of them want to actually stay in Serbia for their Serbian asylum. "All of the interviewed named their aim as to reach the developed countries of the European Union, primarily Germany and France," said Gordan Paunovic from the Info Park. Migrants from Iran attracted public attention in a very short time, after an organized protest at the Croatian border, on December 25, 2017, when a group of a hundred people pleaded the border be opened. This group was composed mostly of the Iranian citizens, whose situation lacks a clear legal language and precedent. After these incidents, the Iranians were transferred to camps with respect to the procedure, without distinction in respect to other nationalities and countries of origin- so that most of these Iranian citizens, who arrived as tourists, are presently in Reception Center Presevo. At this point, Iranians are the third most numerous nationality in migrant centers in Serbia - there are 485 (more than 12%) and their number is constantly increasing. "With all the positive aspects of visa liberalization, it remains unclear why this decision was not accompanied by more concrete measures related to migration management in Serbia, which would prejudice the criticism of the European Union and neighboring countries," adds Gordan Paunovic. Croatia was particularly loud during the protests at Tovarnik, when this issue was raised in front of EU bodies. The increased pressure on institutions, such as the Commissariat for Refugees and Migration, the Ministry of Internal Affairs, and numerous organizations working with migrants on the ground, are sufficient reasons to take concrete measures to limit this phenomenon. The same visa-free liberalization was extended to India- on the very same day. Although much smaller numbers have been recorded for Indian citizens, the question remains whether the tourist-migrant phenomenon will include them at a rate similar to Iran.